Graceful, tasteful and modern- three words which aptly describe the Melanie. 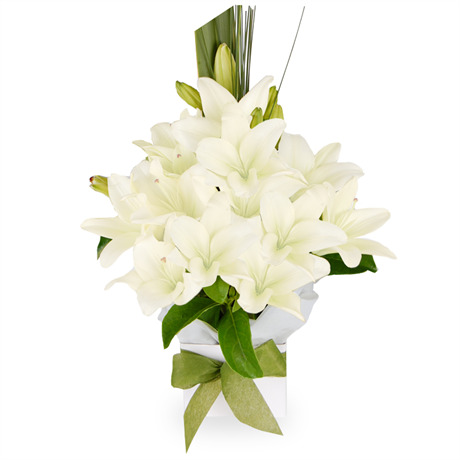 The creamy white Asiatic lilies paired with fresh greenery make this a modern and innovative arrangement. Completed with a pure white gift box adorned with lime green ribbon, the minimalist white and green colour scheme is rapidly becoming one of the most popular floral styles in Australia. The Melanie is suitable as a bereavement arrangement, as a congratulatory wedding present, as a corporate gift, or simply as a ‘just because’. This elegant arrangement is at home in a corporate office, comfortably sits on a coffee table, or makes a beautiful centrepiece for a function/event.